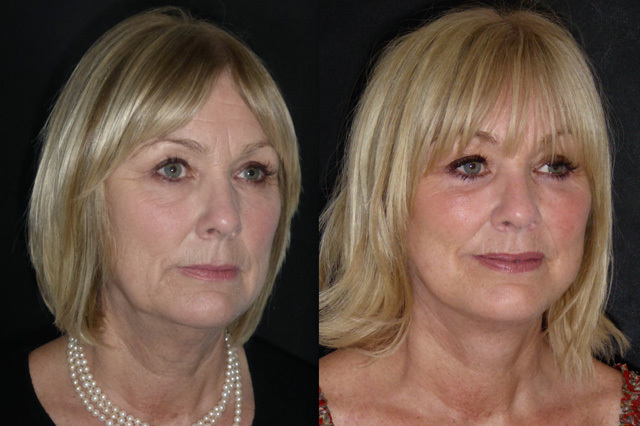 Julie consulted me about her lower eyelid skin crepiness, hollows and loss of jawline. Coincidentally Julie works in a hospital I used to work at a decade ago. 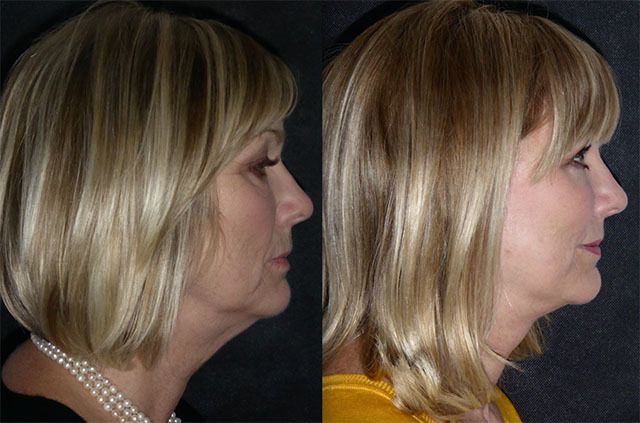 I felt that addressing her lower eyelids alone may lead to an unnatural hollowness as her mid facial descent had already reduced the volume in her mid face. 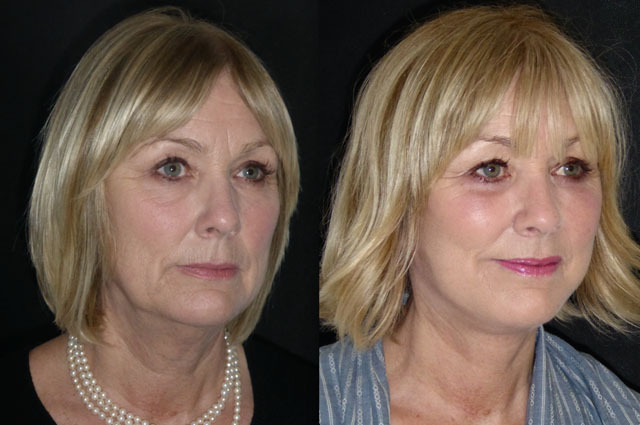 We decided to do a face and Neck lift, platysmaplasty, neck line and and under chin liposuction and transconjunctival lower lid blepharoplasty with skin pinch excision. 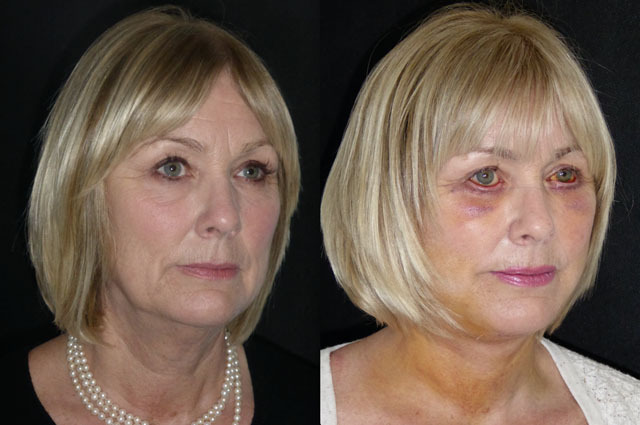 This was performed under local anaesthetic, here is her story. 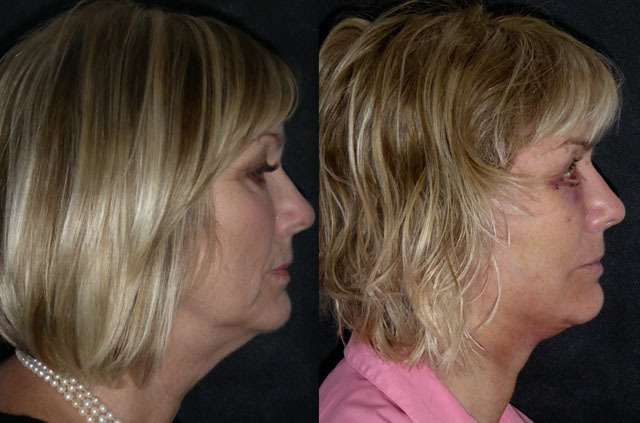 Julie is barely 15 hours after a lot of procedures in these photos. 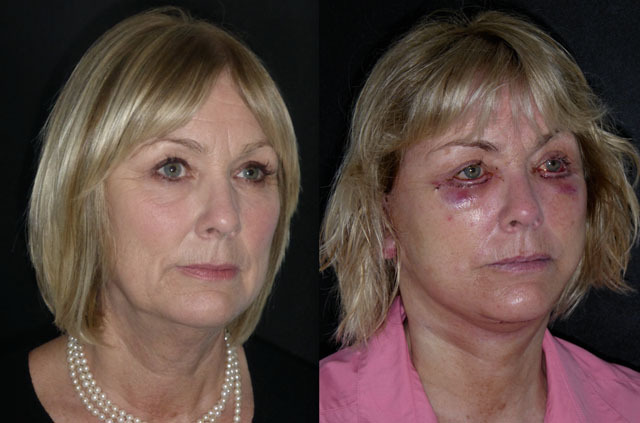 Lower lid surgery always gives a ‘basset hound’ appearance to the lower lids especially in the first few days where post operative swelling makes the lower lids heavy. This will settle over 10-14 days. 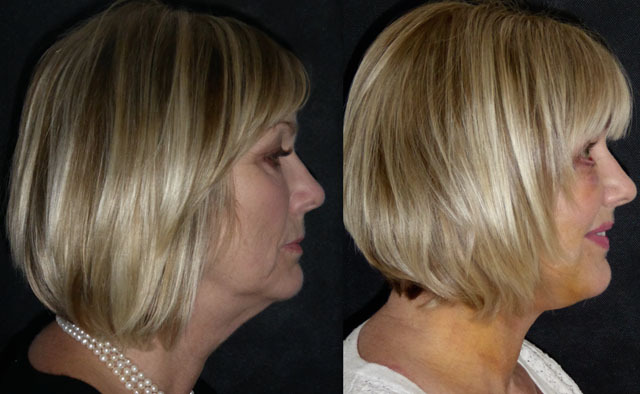 Her face is already a much more pleasing shape and her neck line is pleasing. Looking forward to see how this lovely lady progresses. Here is Julie at a week out of surgery. The eyes whilst scary looking aren’t sore at all. 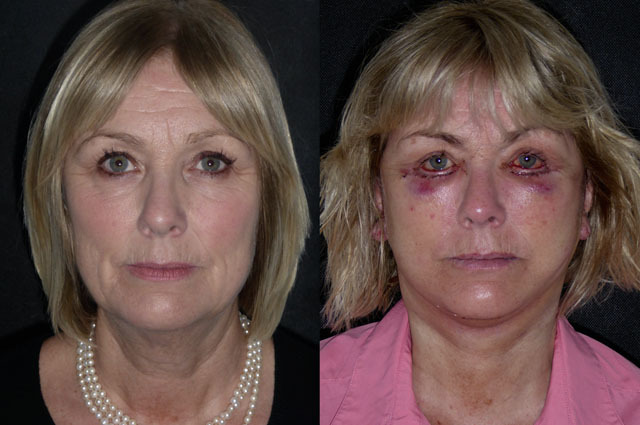 I always tell patients having lower eyelid surgery that the face and neck will be visibly recovered before the eyes, the latter usually take a full 2 weeks. 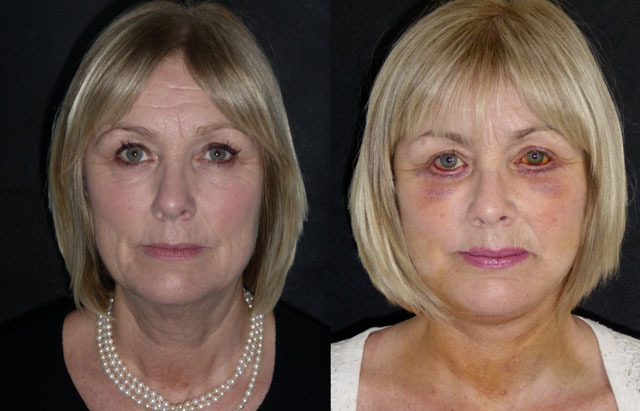 Bruising is settling and swelling has reduced hugely. I have removed her stitches today and Julie will see a big difference in healing speed now the stitches are out. Another week and she should be good to go back to work and face the world! Julie is back at a month and looks wonderful. So fresh and so pretty. 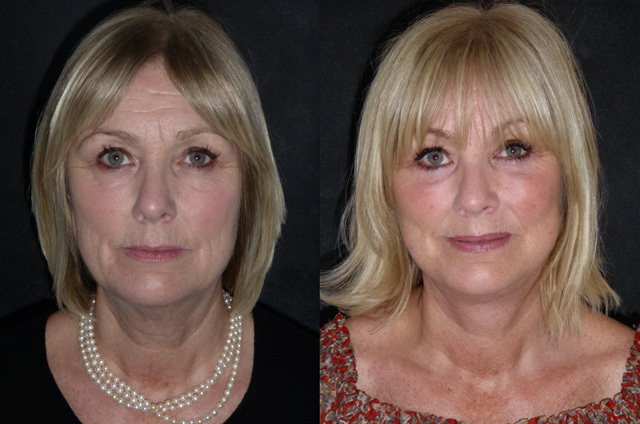 Her long face has been revolumised in the mid face giving lovely support to her freshened lower eyelids. 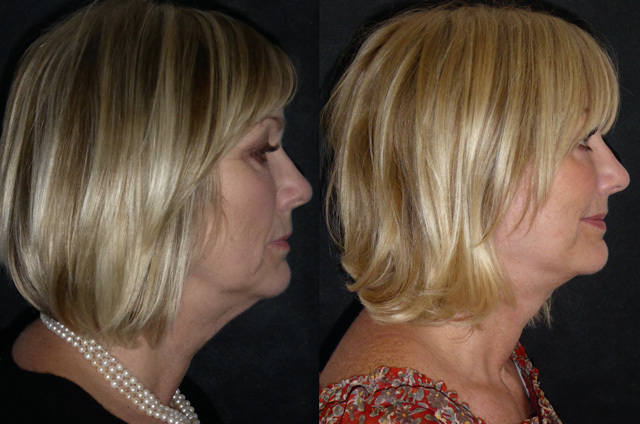 Her jowls have given way to a sweeping jawline and beautifully defined neckline on profile view. Her result should get even better as she continues to heal and the last of the lower lid swelling settles, but for week 4 she looks amazing! 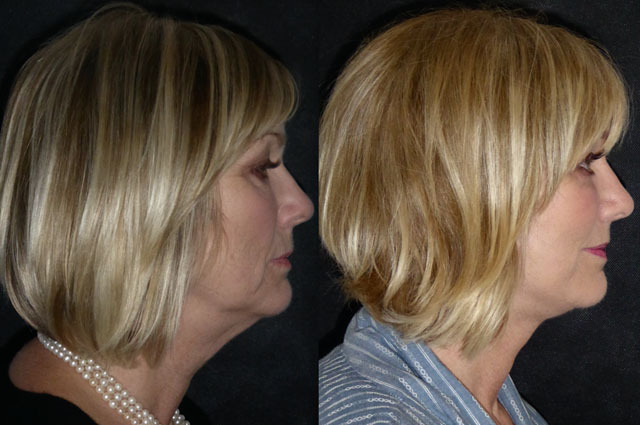 At 3 months, Julie is completely healed from her surgery. Her result is spectacular. 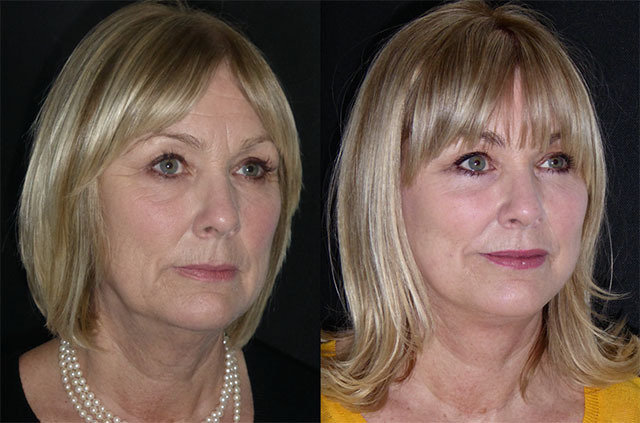 A fresher, defined and volumised face makes her looks years younger and absolutely beautiful. So pleased for her, her face now fits her persona beautiful inside and out. Here is Julie a year out from her surgery. 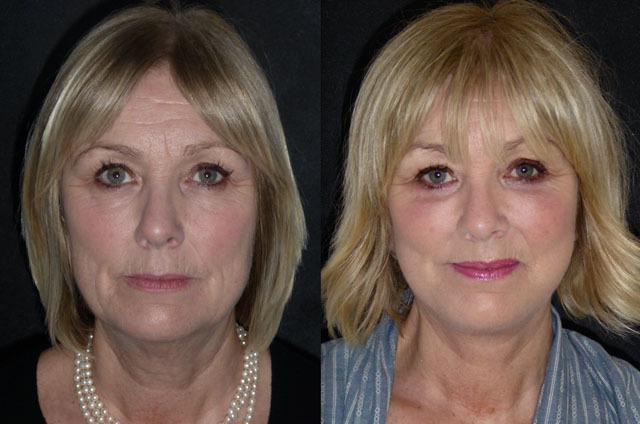 Her result has improved with time as is often the case with four lid eyelid surgery and facelift. She looks just beautiful. 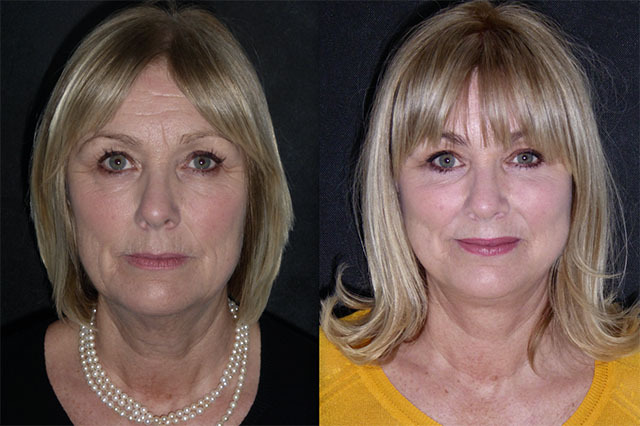 Scars have healed inconspicuously and the ageing appearance that initially led her to me has been replaced by a volumised, proportionate beautifully youthful face. Julie has bee a pleasure to treat and I am sorry to see her go… until next time!